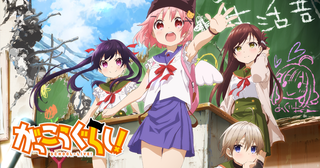 Description: Friend Shitai is the deceptively bright and cheerful OP to the equally deceptive show School-Live! and both are some of my favorites from this current season. So grab your shovel and sing along. Here is the second version of the OP. Look for both the subtle and not so subtle changes that are made as more of the story and situation are explained. Warning: There are spoilers for the first half of the show in this version of the OP.